"An easy, yet very yummy pasta salad. Almost any type of pasta may be used. Best if left to sit overnight." Bring a large pot of lightly salted water to a boil. Place pasta in the pot, cook for 8 to 12 minutes, until al dente, and drain. 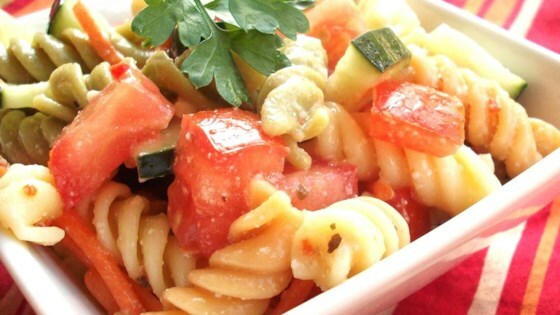 In a large bowl, toss the cooked pasta with the Italian dressing, cucumbers, tomatoes, and green onions. In a small bowl, mix the Parmesan cheese and Italian seasoning, and gently mix into the salad. Cover, and refrigerate until serving.